Forget Joseph Conrad, forget Henry Morton Stanley, I was just trying to get from Kisangani upriver to Kindu and what other route to take, in the absence of road or rail, but the river-road everyone else takes? 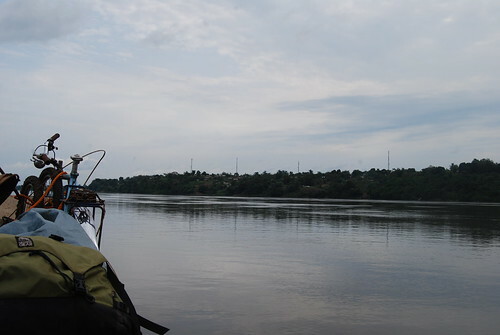 Pulling out from the port of Ubundu in the late afternoon and heading upriver and south to the port of Kindu. Crafted from one tree, consisting of rot-resistant wood, the pirogue is the original flat-bottomed dugout canoe. 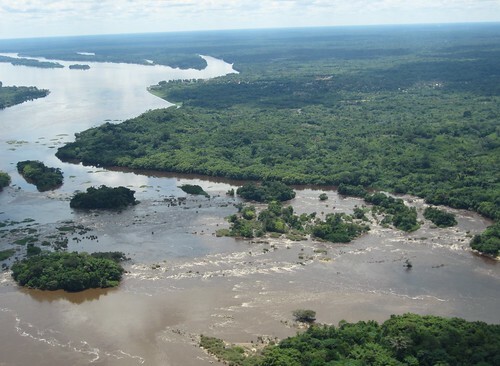 It is aptly suited for the Congo River also known as “Le Fleuve”, and in this stretch as the Lualaba. 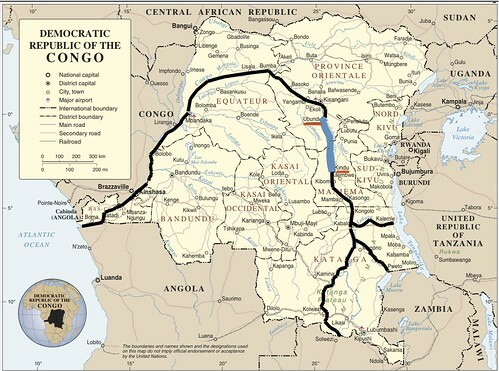 It is the deepest river in the world, also the ninth longest, and essential in connecting villages and cities in the DR Congo. 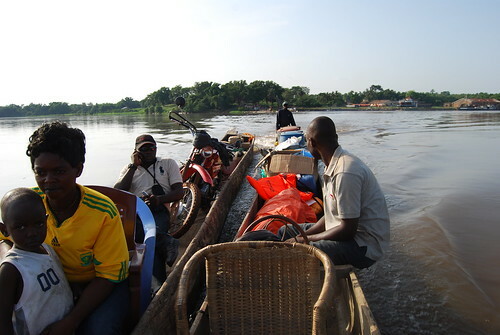 The pirogue is emblematic of Congo life. It can be felled and carved by villagers, it is a source of transportation, trade, and fishing, and while even modern roads wash out in rainy seasons, the river is a constant in peoples’ lives. Our two dugouts lashed together and moving with one 25 horsepower outboard motor. The current is strong. It would take an army of paddlers and plenty of time to move goods upstream, so an outboard motor on a pirogue offers a business opportunity to those with the ability to finance. In our case, we are bringing fuel and supplies from Kisangani south to Kindu, where they will eventually make their way west to Katopa on motorcycle, or “moto”, diving into the TL2 forest, AKA Tshuapa-Lomami-Lualaba, wherein lies one of the Harts’ survey bases. 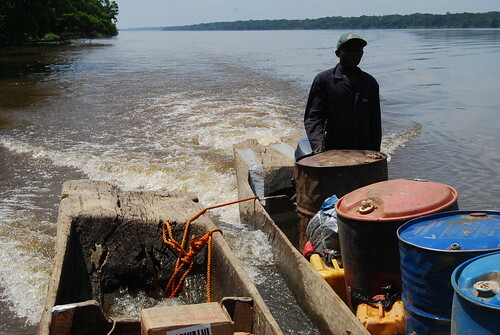 To move the barrels of gasoline, generators, soap, food, bicycles, motorcycle, etc, it is necessary to circumvent the large rapids near Kisangani. A part of the series of rapids between Ubundu and Kisangani. There is a rehabilitated 120km road bisect to the river-port, Ubundu, as well as a dilapidated rail line built in the colonial days that is nearly dysfunctional. In the earlier part of the last century, the flow of raw materials towards South Africa, would pick up another rail that was laid from Kindu around another series of rapids, south-west towards the border. In between is the section of the Congo River on which we are about to launch. 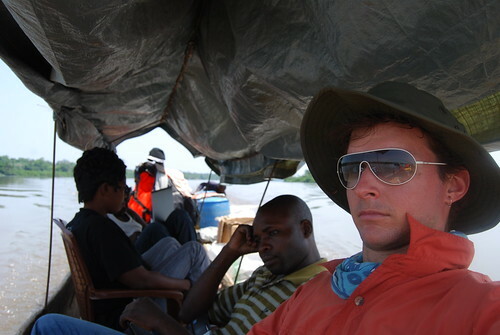 Sabin, Robert and Jesse were following the blue stretch of the river between the rapids above Kisangani and the rapids above Kindu. Day one of the trip: The supplies are taken on “lorry” truck, while I ride with Robert Abani at top speed on a moto and meet Sabin in Ubundu to load the twenty five-foot pirogue. Once loaded, we are harassed by the usual provincial paper-pushers, and coerced into taking aboard a younger sister, Luise, of so-and-so, and her 2 year old son who require passage to Kindu to reunite with the soldier-father. At first it doesn’t seem possible to fit the added passengers along with all the stuff, and our small crew, in one pirogue. Our departure is delayed into the late afternoon. Sabin decides to lash another pirogue alongside and create a more stable pontoon mini-barge, tied with rope at the bow and stern. Sabin had rigged a “custom-flimsy” collapsible iron rebar shade structure. And Luise, imposed passenger, became our good-humored cook for the ride. We finally set off at near-dusk with the whole of Ubundu watching and rode through the dark to a little beach where we set up camp, with the consent of the fisherman who lived up the hill. Day two: Green: like a deep pile rug when seen from above. We follow the sparkling glass tongue as we chug further upstream, the momentum from the constant motor creating a little breeze, winding around bends that could be islands and through small lakes where the river widens. Life, as seen from the river, is increasingly simple and labor intensive. I don’t know the obligatory customs through which a man here could strike out on his own, claim a piece of land, and start a family, but it seems a tangible proposition. The combination of thick forest and river offers a source of food. 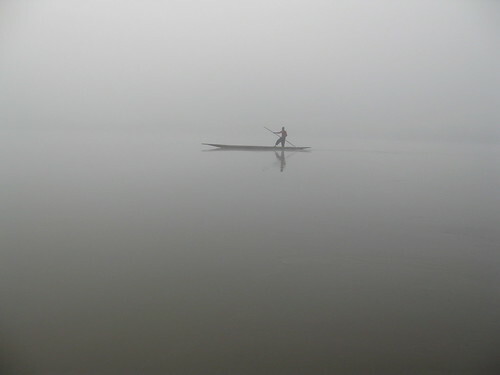 The marketplace is a passing boat, to paddle after for barter. Some villages specialize in making charcoal, a resource that is desperately needed, but not sustainably harvested. Life seems frozen in tradition. I realize at some point I have forgotten the day. I knew the trip should take three or four days, but what did that mean? The fisherman selling us his fresh catch could’ve been his father, or his father’s father; only the worn second-hand t-shirt with another language betrays some indirect connection with the world at large. 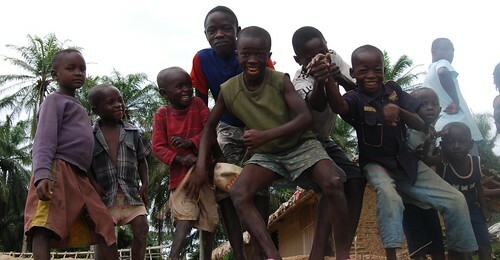 Within the DR Congo the world is diverse, most people speak two or three languages after their native tongue – but the t-shirts are mainly English, language of the West. In general the reception I get from passing villages, along with the predictable shouts of “muzungu!” from children, varies from apprehension to excitement to reserved calculation. Did my “mondele” predecessors cause similar reactions? I don’t blame the Congolese for mistrust. After all, the river is a highway that allowed access for exploitation and theft, and the pirogue was also used by the likes of H. M. Stanley and later by the Belgians. Why, after all, would anyone go through all the trouble if they weren’t after something? Thankfully I don’t have to explain myself; Sabin and Robert can do that for me, and often the stares mix with tentative smiles. Acting out for the camera. Everything changes when the music is blaring– the universal sign of brotherhood. We have a little boom box with an MP3 stick full of Congolese pop, and a generator in the bottom of the boat charging its batteries and the computer Robert occasionally opens. The water starts to pool up near the wires, so Sabin fixes the leak with a patch cut from a tin sheet with his machete, a cardboard gasket, and some nails; I am glad I brought a hammer along in the bicycle toolbox. Sabin uses the machete and his teeth to strip the wires for the surge protector and voltage regulator, essential for a computer or modem in this country, even in the city. We got power! Luxury cruise commence! When is lunch? Luise cooking fish in the kitchen. There is plenty of room in the bottom of the boat for our newfound friend Luise to prepare muchicha (leafy greens) that we buy en route. Luise mixes hot water into the ground manioc flour with a palm stem and cooks up some salt fish (mmm…never again. or so I thought). I wonder if we could’ve made the trip without packing food at all, although no one can argue Nescafe, powdered milk, and sugar keeps us in good spirits. What you really need is a bambula (small perforated sheet metal grill) and some coals to boil river water, and a small store of aluminum pots and metal plates and cups, and a thermos. We pull up to a village to buy some rice after we spot a large pipe shooting discarded rice hulls out of a shed into the river. The folks here are anything but subtle. They stand around staring and cracking jokes that can only be about me. They are measuring rice into our bucket with a cup….some standard system of measurement. While we wait, Luise asks a villager for a hot coal from the fire to start her bambula, even in the heat of the day. Patience is required as a business transaction unfolds in Congo. Finally some agreement is reached. Part of the sale involves throwing in some sugar on top of our Congo francs. 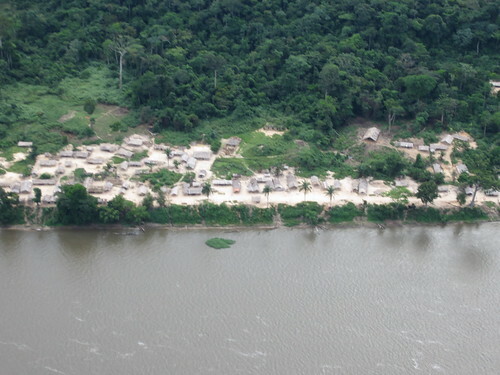 Helicopter view of a village between Ubundu and Kindu. The sun is inescapable, so close to the Equator where it rises and sets in haste. We pass a four-pirogue, two-engine flotilla bound side-by-side, inching upriver to the nearby open market. As usual, the mix of stares, begging hands, and the occasional thumbs up from the dudes. One of them is a flashy clothes merchant with a big duffel bearing the bright logo of the United Colors of Bennington. He has a clown-like matching hat. Don’t be surprised if the hat you buy wasn’t previously sweated-in, on the way to market. Then again, who can count the number of hands these clothes have passed through, bearing logos and words unknown to the owner? Even the African print bolts of fabric that the ladies cut for themselves, although designed in Africa, are largely printed on wax machines in Holland and England or, more recently, in China. Standard dude wear is jeans and a shirt you may have worn at some point. Dugouts are lashed together to make a single flotilla plying the river markets. 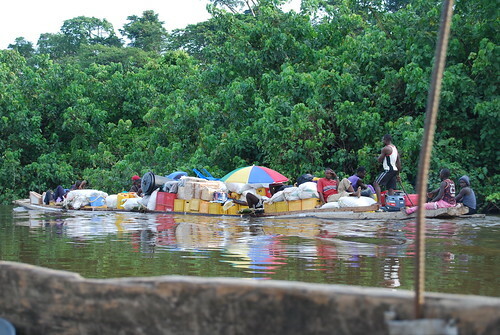 The acquired goods (including a lot of bushmeat) are brought to the commercial center, Kisangani. We push long and slow. The moon and stars come out, and we navigate easily between the dark banks for a few hours until we reach a sort of truck stop for river riders, a confluence with a lazy tributary, although the beach is too crowded. People lie scattered on the ground, exhausted, some with fabric covering their head from mosquitoes. There is a giant pirogue loaded to the sky with lorry truck tires. The air is foul. We decide almost without speaking to press on in the moonlight. At the next village we find a small bank off to the side to set up camp and sleep for what feels like a few hours, waking before dawn. Day three. I hurry to tear my tent down in the dark while chomping on the peanut butter I had brought, hoping for hot water sometime in the next hour. We ditch one of our pirogues at a village because we aren’t making enough miles in a day. Sabin negotiates for its safekeeping. Goodbye luxury-cruise: we lay the moto sideways, straddled across jerry cans of gasoline, one handlebar dragging slightly in the water. No shade structure– it is too tippy and the wind has too much purchase on the tarp. I like sitting on the bottom of the boat on my thermarest, and others eventually join me to enable our center of gravity to be lower than sitting in the plastic patio chairs we had used the day before. You can feel the boat rock to the side every time someone moves. It is nothing compared to some of the over-weighted cargo pirogues we pass, an image my friend later dubs the “infiniti boat” due to the lack of discernable difference between interior and exterior. Riding just at the surface. Sabin takes the tiller from his assistant pilot in a slight headwind, steering facing forward with his arms crossed and the tiller between his thighs. I lather on more sunblock and try to hide where there is no shade. Taking a nap on my thermarest, I cover every exposed part of my body with some article of clothing and awake sweating viciously. We buy a catfish that turns into an amazing meal that night, but for now there is no room for Luise to cook, so we have leftover salt fish stirred into the muchicha and manioc dumplings. I pop another worm pill. Suddenly there is loud singing and drumming. A fifteen foot pirogue, completely loaded down with people standing in a single file, dancing on what appears to be the surface of the river, sail past on the current like a conga line on a conveyor belt: happy to be alive and going downstream. Not unlike a gospel choir in the Louisiana bayou, but more raucous, just short of tipping the boat. As they approach, I am partially obscured behind bikes and luggage in the bow, so when they spot me they are surprised, but since I am beaming at them they are beaming right back, and singing both in our direction and to the river at large. On the third night there is a dazzling lightning show across the river a few kilometers away as we sip our tea, vivid streaks of mangled white-hot toaster wires, leaving imprints on the retina. The rain reaches us all of a sudden, but the lightning doesn’t touch ground near the river. Vague flashes behind clouds in all directions. We are camped on a tall bank above the river in a village of a dozen houses. The yard, like many villages, is compacted earth, swept often, and pretty level, so we sit on plastic chairs of the kind you can find anywhere and drink whiskey cafe. 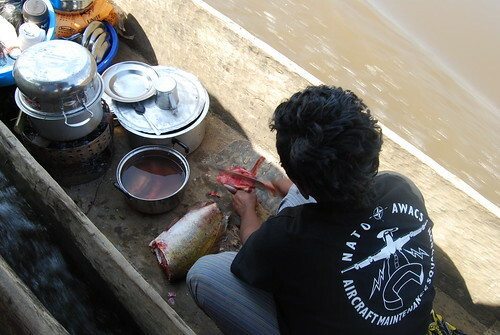 We share a beautiful meal of fish with two other employees of the Harts, who are down from Kindu for another mission. Robert joins them the next day, taking the motos to another forest camp, Bafundo. We push off with one less body and no moto in the boat. Day four: It is favorably overcast, only showering briefly. We have a leisurely start this time because the GPS shows we have roughly seventy kilometers left to Kindu, which was accomplished twice over yesterday. The river is moody, folding the fog among its curves and accentuating distant terrain. Clouds seem to be blowing downstream, bringing an occasional chill. The first signs of Kindu are the auspicious cell phone towers beginning to show over the impenetrable wall of green. What’s a few more bends in the river? On second thought, I wonder how many towers are required for a town this size. Three here, four over there? Kindu appears, telephone towers first. Kindu seems bizarre, this small stamp of space with communication. For the most part the country is without communication for business; so many things we take for granted in daily operations–being able to prearrange a trip, order materials, –being able to reserve cargo space without being there in person, a functioning mail system. Here in Kindu there is a burst of communication after the “silent river”, a constant yelling and texting into the little Chinese box with Coltan capacitors — the cell phone. Even with all the towers it seems there is little reliable coverage for any cell phone company; many people in this town carry two or more phones, each with a different sim card, one for each network. I am surprised to find an internet cafe in Kindu, one that works better than anything found in Kisangani. I suppose it comes down to the individual who started this business. If you want to talk micro-finance, perhaps a good place to start would be a “cyber cafe.” Libraries haven’t been funded here in decades. Internet is the only window to a larger world. You would think this would be a clear demonstration of local demand and supply. So why is there only one cyber-café in this provincial capital? This is a country of cash. You see people counting it, discussing it, comparing it, arguing over it. Debts, not credit, provide impetus. Does the cost of surviving leave enough cash for any communication beyond the cell phone? – one dollar worth of units at a time? My river trip ends with questions, but what a trip! It was something I couldn’t have dreamed up: having the bow seat in a tranquil river paradise for four days in our private pirogue. No one gets to do this kind of stuff. As John put it, it’s a bit different than taking six-pack, swim trunks and speed boat out on the lake for a weekend. Life here, along the river, seems so ordinary yet so original, and certainly, not easy. This entry was written by Terese Hart, posted on 2012-06-02 at 12:14 pm, filed under About the project, Kindu. Bookmark the permalink. Follow any comments here with the RSS feed for this post. Post a comment or leave a trackback: Trackback URL.